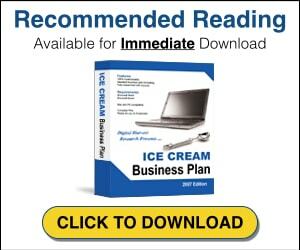 If you are in the ice cream business it is important to maximize every inch of your advertising space including your store window. 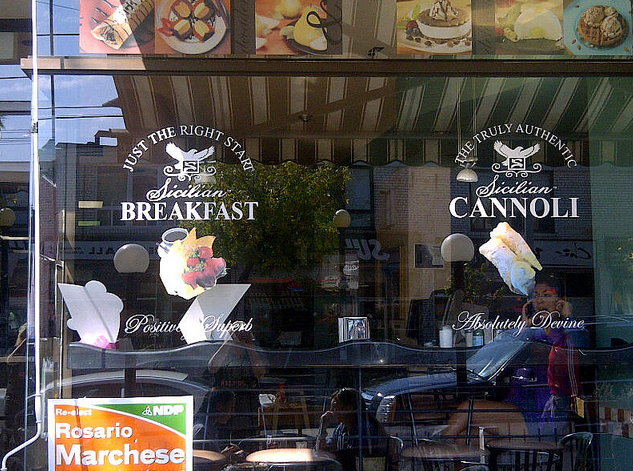 In this photograph of a Toronto Sicilian ice cream parlor you will notice that the owners have made use of the windows by putting stickers of their other offerings such as a Sicilian Breakfast and a Sicilian Cannoli. 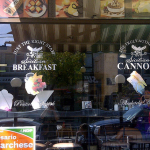 The decals used to decorate the windows are not so obtrusive that passerbys cannot see into the cafe. These ads as well as the colorful strip of colorful gelato and ice cream photos that line all of the upper windows in the buildings are easily seen from the street. You will notice too that the photographs of the food offered are professionally done and include many classic Italian desserts including gelato and waffles, gelato inside a pear and all kinds of little cakes and pies. The entire cafe is also wrapped by a patio so these suggestions are also visible to people who just dropped by for a gelato or and espresso. Photo by Donna Lypchuk 2011. All Rights Reserved.